Up to this point, metal loss detections have been aimed at localized, small areas of corrosion to assess threats based on aging material and environmental influences. However, it is possible that product transported by any given pipeline can also cause a more general loss of wall thickness, also known as erosion-corrosion. This effect has not yet been the focus of most in-line inspections, as this combined effect normally happens on the internal surface of slurry pipelines, where, until now, the consequences of a failure have not significantly impacted operational revenues or been in the public eye. The rise of social and legislative pressure on mining companies based on recent incidents increased the need for more robust operational safety in the industry. Together with our partner Mineração Paragominas, the ROSEN Group is beginning to develop and validate an approach for the effective and repeatable estimation of erosion growth rates to estimate the associated risk. What is Erosion? And Why is it a Threat? Before moving on to the approach, we need to understand the need for it. The threat in pipelines, erosion or erosion-corrosion, is similar to channeling corrosion. Channeling corrosion is continuous metal loss in a long axial direction and of narrow width. This typically occurs at the bottom of a pipeline and often in water lines (water injection) or in oil lines where water is the primary medium. It is commonly associated with movement of particles (sand, corrosion product such as rust, scale), which remove the wall layer by layer. However, whereas channeling corrosion affects mainly the bottom of the pipe, erosion has more general effects on the entire circumference. In pipelines affected by erosion, the wall is continuously stripped of any corrosion inhibitor film and internal coating. The presence of erosion can greatly accelerate corrosion inside the eroded wall. As a result of erosion, an increased maintenance interval is necessary, including repairs or even replacements. The mobilization of equipment in order to conduct the repairs implies significant cost. The real need for an approach is best demonstrated by a real asset. Mineração Paragominas owns and operates a 24” x 242,710 km bauxite slurry pipeline between Paragominas and Barcarena in the Amazon delta. This pipeline transports bauxite slurry with a composition of 50% solids at an average flow rate of 1,900 m3/hour at a temperature of 30°C. A corrosion inhibitor and biocide are batched, and cleaning pigs with discs, cups and steel brushes are ran through the pipeline every two years to remove bauxite deposits from the internal surface of the pipeline. These conditions are why this asset needs a validated approach for the estimation of erosion growth rates – making it the perfect guinea pig. Integrity assessments depend on available data. This data needs to be reliable and accurate, so that estimates can be calculated and statistical approaches can be used to assess the need for maintenance in sections of the pipeline. In this case, the evaluation technique applied relies on the use of ultrasound measurement technologies (UT), collected over several inspection periods. At the time, this technology was selected because it measures the remaining wall thickness directly by using sound waves. Other technologies are less reliant. For example, circumferential magnetic flux leakage (MFL-C) is affected by the inhomogeneous magnet field, while axial magnetic flux leakage (MFL-A) is affected by the surrounding magnet field, influencing resulting flux leakage, and internal eddy current (IEC) is unable to measure the internal diameter values accurately enough … and the list goes on. However, UT technology itself is also not without its faults. The measurements rely on sound pulses, which are sent out from the tool in a straight beam. The resulting sound echoes are affected by the smoothness of the internal and external surfaces of the wall caused by erosion-corrosion. Also, due to the relatively sharp edges of the channeling corrosion, the UT shoes carrying the sensors might tilt, resulting in a sound beam that is not perpendicular to the wall, which affects the quality and quantity of received echoes. Despite the technical issues our Evaluation department might face due to the state of the pipeline and the tool design, evaluation of these types of erosion-corrosion is not impossible, and in fact this data is what is needed to determine erosion along the pipe wall. For this specific case, data was used from previous inspections, which had been performed in 2008, 2011, 2014 and, most recently, in February 2017, making available four complete data sets. Now that the data is available, this is where the new approach for effective and repeatable estimation must be fine-tuned. In standard evaluation, boxes are created to describe the general area of metal loss. However, in areas where general erosion has affected the pipe wall and an additional corrosion channel is present, often only the corrosion channel is reported, and the loss of metal overall is not recognized – the most measured value (or calculated wall thickness) is lower than previous inspections, but this has been neglected in most inspection comparisons. The best way of evaluating a line affected by erosion and channeling corrosion is to avoid splitting areas into too many boxes. Levels of corrosion depth should be grouped based on topographical elevation lines. In these cases, only the areas surrounded by blue contours should be separated, and, per spool, one additional box should be created describing the area bordered by the red contour. Once the data has been evaluated and features identified, further processing and assessments allow for the true added value to be gained. Facts become knowledge. To determine and report on corrosion-erosion features and their potential risk, the identified anomalies are compared within different timeframes to estimate a growth rate per matched erosion feature in mm per year. In this example, 2014 and 2017 in-line inspection data were compared, and the erosion rate was calculated in the integrity software. This is done by aligning all the evaluated data sets, and any information on an anomaly is processed and put into the needed format. Attributes such as remaining and measured wall thickness, absolute depth, minimal wall thickness, depth in percent, o’clock position and log distance have been uploaded for the years 2011, 2014 and 2017. The dataset is aligned to the centerline, and any other calculations can be performed. As a result, every single match received an individual growth rate, and all matches were summarized in a segmentation containing the overall erosion growth rate. Once the erosion growth rates are calculated, Mineração Paragominas is able to apply them to plan their maintenance activities. The resulting erosion growth rates are applied to each erosion feature reported along the pipeline to calculate the safety pressure at certain points of time, e.g. in five years as shown in the figure below. Risk is an interaction between the likelihood of occurrence of failure due to erosion and the corresponding consequence of that event. The erosion growth segmentations, introduced earlier, were integrated into the customized Quantitative Pipeline Risk Assessment Model implemented in Rosen’s ROAIMS software for Mineração Paragominas to perform risk assessments. The ROSEN Group implemented the algorithms into its in-house integrity management software (ROAIMS) to calculate the repair date per pipe spool. Mineração Paragominas factored them based on criticality from 0.001 to 10 as shown in the picture below. 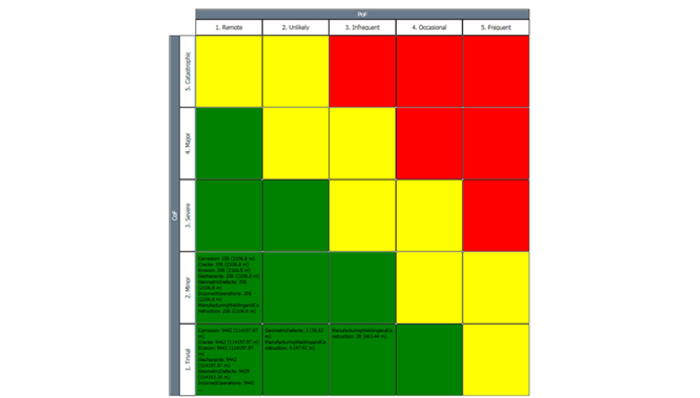 An elemental part of a comprehensive risk assessment is the inclusion of a consequence model to predict any effects of an incident. In this case, the consequence model included two spillage scenarios based on the detection capability of the pipeline’s control system. A specific geospatial study was done to identify potential receptors impacted by the simulated spillage. The risk is calculated multiplying the results of likelihood of failure by the consequences and factorizing the results following Mineração Paragominas’ risk policies. Shown below is the risk profile for the threat of erosion, identifying sections of the pipeline where the risk is higher due to greater impact on receptors or high likelihood of failure. The risk model provided to Mineração Paragominas enhances their operations while increasing efficiency in their maintenance activities. Facilitating the visualization of areas that require intervention based on traceable results and quantifiable data, the model was personalized in accordance with Mineração Paragominas’ needs and requirements based on their issues with erosion and corrosion.